Please read the information below to ensure that you have everything you need before you start the eProtocol application process. To access the eProtocol application, you’ll need a computer with an Internet connection. Firefox 48+ and Firefox 50.1. In Firefox, pop-up blocking is enabled by default. Select Tools–>Options. The Options window is displayed. Click on Privacy & Security on the left hand side. Scroll down the page to Permissions. Go down to Block Pop-up window and click on the Exceptions… box. Add the site you want to allow pop-ups by typing in the URL (https://eprotocol.bellberry.com.au) in the box under ‘Address of website:’ and then clicking Allow. Click Close. The Allowed Sites window closes. Click OK. The Options window closes and this task is complete. In Google Chrome, pop-up blocking is enabled by default. Click the Google Chrome wrench icon to access browser settings. Select ‘Options’ to open the Options dialog box. Add the location of your BMC FootPrints Service Core instance or instances to the Pop-up Blocker exception list (either the Distinguished Name or the IP address will work) in the Add a new exception pattern field. Make sure Allow is selected from the Action drop-down list. Close the Content Settings tab to exit the Options The task is complete. Click on Safari on the upper left of your screen to open the drop down options and choose Preferences. 1. 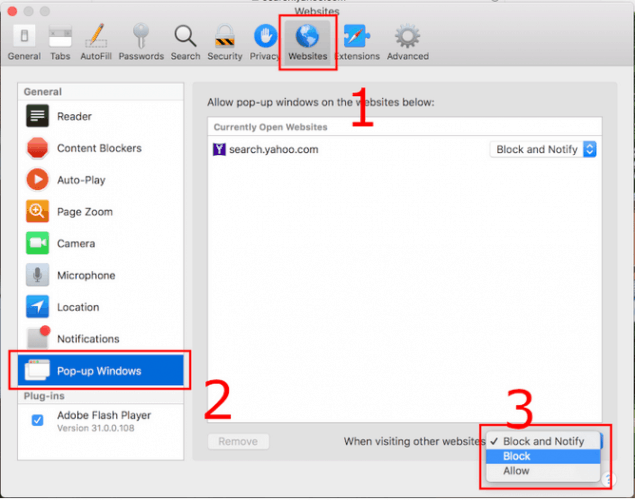 Make sure “Block Pop-Up Windows is unchecked as in the image above. Then click Preferences. From the menu, choose Security. Make sure Block pop-up windows is NOT selected. If it is selected, click it to deselect. Do not use your browser’s BACK button – This will avoid taking you out of the system, instead, use the menus and links within the application to navigate. SAVE frequently – eProtocol will time out after 30 minutes of inactivity. Only actions which cause the page to refresh or reload (such as saving or navigating to a new section) are indications to the system that your session is active. Read the Instructions/Help – Many pages in the application offer instructions. Use the help button located in the top right hand corner on the page to help guide you and answer most common questions. Be patient – Some processes can take a minute to run. Although data is loading, your browser may not indicate activity. Sign Out when done – Always click “Sign Out” and shut down your browser completely (close all browser windows) when you are finished using eProtocol. This will not only help keep your information secure, but will also release any edit locks you may have had on protocols, and allow your colleagues on the project to open the protocols in edit mode. Now you are ready to start the application submission process. Please visit our Register for eProtocol section if you are a first time user that has yet to register on eProtocol or our Working with Applications section for the next steps. If you’d like further help with using eProtocol feel free to sign up for one of our online training sessions.